Fearing for her life, outspoken commentator Thandekile Moyo fled Zimbabwe this week with little more than the change in her pocket. My name is Thandekile Moyo. I come from Zimbabwe. I was born and bred in Zimbabwe. In all my 34 years there, I have never known peace. I grew up in Matebeleland, where in the minds of my parents, older siblings and friends, memories of the 1980s Gukurahundi massacres were still fresh. We inherited a profound fear of soldiers. Whenever we saw or heard a military vehicle on our way from school, we would all scurry into the bushes and hide. Hundreds of children in little maroon uniforms, all living on high alert. I went to university in 2003, when the economy was well on its way down. My cousin and I would have to smile and “chat up” motorists who gave us lifts to campus, just so we didn’t have to pay for transport. In my final years, students would go for days without eating. We lived on a prayer. Through all this, I noticed the lavish lifestyles of Zanu-PF children and those close to power. Their lunchboxes were always filled to the brim. They were brought to school in their Mercedes Benzes, they had cellular phones and they spoke with a twang. We called them “amasalads” — those who were privileged enough to eat salad at home. Not all amasalads were Zanu-PF kids, but most were. This taught me about inequality. As an adult, I learned that most of it was linked to corruption. And I detest it. Because I have never known peace and because I have learnt that my struggles over the years were man-made, I deplore injustice of any kind. Injustice against each other at both the personal level and the mass injustice by the powers-that-be against their populations. Last Saturday, Emmerson Mnangagwa, president of Zimbabwe, announced yet another injustice: a 150% increase in the fuel price. To compound the insult, he insisted that the bond note — the pseudo currency introduced by the administration of former president Robert Mugabe — was valued at 1:1 with the US dollar. This is a lie that has impoverished Zimbabweans and brought the economy to its knees, allowing the politically connected to profit while devastating the savings of ordinary people. In response to the fuel hike, the Zimbabwe Congress of Trade Unions called for a nationwide stayaway. I was in full support, and participated in the accompanying demonstrations in Bulawayo. The crowd was excited, yes, but peaceful. Imagine my horror when the riot police came with their batons and their teargas — a modus operandi repeated across the country. The city’s high-density areas turned into a war zone. It felt like teargas was being thrown at everyone, everywhere. My friend’s eight-week-old niece is battling for her life after a canister of teargas was thrown into their home. 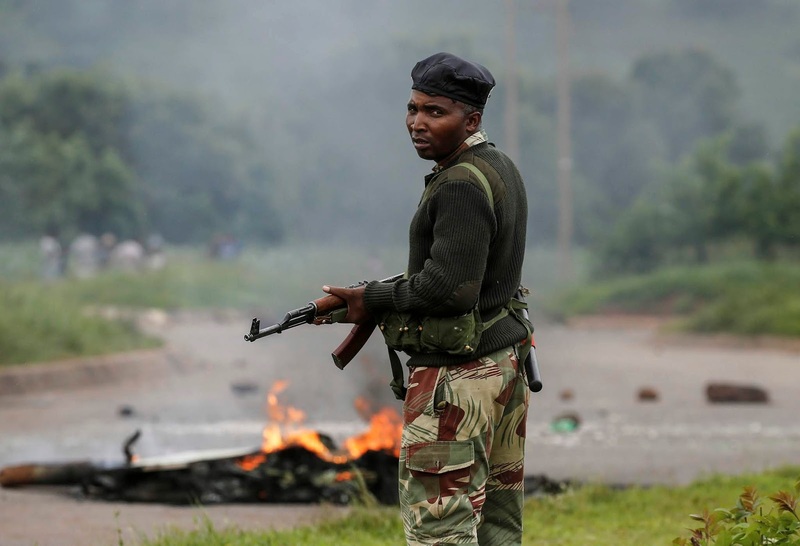 The government of Zimbabwe blamed the protests on opposition parties and civil society. I received a tip-off that my name was on the list of “troublesome internet activists”. A few days earlier I had appeared on Al Jazeera, commenting about the unjust fuel price hike: little did I know that this, along with my outspoken tweets, had made me an enemy of the state. I have always known just how dangerous the Mnangagwa government is. But I have never entertained the idea of being afraid of them. I was so contemptuous of their disrespect for humanity, human rights and human life that I had always refused to be governed by just how dangerous they are. So when my instinct said run, I wasn’t sure how to respond. I decided to take a bath and clean my room as I contemplated what to do. I slowly realised that I was preparing to leave: I was putting my house in order in preparation for an indefinite absence. I checked whether I could get a flight anywhere. All systems at the airport were down. The only option was road travel. Only one problem: I had no money. I had about R120. I decided to just go. I would see. I threw my laptop and a few toiletries in my handbag and went to knock on my dad’s door. What was I going to say to him? My heart breaks as I think of how shocked he was, and how he tried to hide the shock from me. He is not on Twitter, you see. “Do you have money?” he asked. I lied and said “yes”. He gave me everything he had in his pocket: $4 (R55). He offered to transfer money into my mobile money account, but I said: “Don’t worry Dad, I’m good.” I was afraid he’d need that money because all the shops and the banks were closed. I couldn’t tell him where I was going. It was the only way. I called my brother to say goodbye, but didn’t reveal my plans to him. I don’t know whether they’ve told my mum yet. Part of me hopes they haven’t. It’s her 60th birthday this week; I don’t know whether she’ll be able to handle it. So here I am, in exile and afraid. Not for myself, but for my people. Zimbabwe is imprisoned by very dangerous men. When Mnangagwa announced the fuel hike, he was flanked by Vice-President Constantino Chiwenga and Cabinet Minister Perence Shiri. All three of them have been implicated in the Gukurahundi massacre.